People travel to the Gulf Coast of Florida for so many reasons. The emerald green ocean, sugar-white sands, and charming seaside communities of 30A are irresistible! But what, exactly, is 30A? Is it a town? Is it a scenic highway? In fact, it’s a little bit of both! 30A describes a strand of several small beach towns along the Gulf Coast’s Highway 30A. We’re here to help you get to know these unique micro-destinations! Read on to learn about these communities, then be sure to consult our complimentary 30A Vacation Guide. It contains all of our best local restaurant, shop, and beach recommendations! Rosemary Beach has become one of the most popular 30A communities, and it’s no surprise. Stunning homes, walkable footpaths, and beautiful boardwalks define this close-knit community. Keep an eye out for family-friendly events in Rosemary Beach, too! One of the oldest 30A coastal towns is Santa Rosa Beach! It was founded in 1910 and became the very beginning of South Walton. Today, Santa Rosa Beach is home to delicious dining options and a thriving network of artists. If you’re interested in rare land formations, Blue Mountain Beach is the place for you! You can easily access Draper Lake and 30A’s other massive dune lakes by foot, bike, or car from this community. Named for its native blue Lupine flowers and the Gulf Coast’s highest altitude, Blue Mountain Beach is truly unique. Hand-painted signs, pet-friendly spots, and even friendlier locals characterize Grayton Beach. This laid-back beach town is home to iconic local restaurants, shops, and coastal dune lakes like Western Lake. Be sure to also check out Grayton Beach State Park when in town! An essential ingredient of an unforgettable 30A vacation is a day in Sandestin! This resort beach town is home to incredible gourmet meals, championship golf courses, spas, and so much more. Bring the whole family and be sure to visit The Village of Baytowne Wharf in Sandestin. There, you’ll discover kid-friendly entertainment, local shopping, and upscale dining! Watercolor is so much more than a pretty name. It’s an eco-friendly 30A community that’s known for high-end beach cottages, beautiful boardwalks, and breathtaking natural surroundings. Aside from hiking, biking, and beaching, be sure to check out Watercolor’s restaurants, shops, and tennis club. Dune Allen is another 30A gem to visit if you’re a fan of rare coastal dune lakes (and who isn’t?). There are three of these incredible geographical structures in Dune Allen alone! This is a great town for all manner of outdoor recreation. Seaside is the ultimate family-friendly beach town! This artsy spot is home to a fantastic farmers market, a nationally-acclaimed art festival, and the picture-perfect pastel homes that appeared in The Truman Show. One of the newest 30A beach communities is Gulf Place! In addition to lush green spaces and 30A’s signature white-sand shore, the shining star of this community is Gulf Place Town Center. Here, you’ll discover plenty of charming boutiques, cafes, and restaurants. Seacrest Beach is characterized by quiet charm and an eclectic array of coastal homes. Take a stroll through this beach community and discover unique shops, local favorite restaurants, and a wide variety of “ecosploring” opportunities. Seagrove Beach is just as beautiful as it sounds! Check out Point Washington State Forest when in town and view the lush maritime forests that came to define this region more than a half-century ago. There are also several shops and restaurants to try here! Whether your favorite pastime is golfing, hiking, biking, or simply soaking up the sun, Watersound has something fun for you to do. It’s a gated community, but welcoming to visitors nonetheless! Miramar Beach is one of 30A’s most popular communities! You’ll stumble upon colorful shops, paddleboarding outposts, and countless scenic spots overlooking the Gulf. You can’t go wrong with a trip to Miramar Beach! If you’re looking for an untouched coastal paradise that’s both off the beaten path and close to all of the action, look no further than Inlet Beach. Here, old meets new. You’ll see both cozy beach cottages and modern homes. Be sure to check out Inlet Beach’s local-approved restaurants! Get a glow laying on a pristine beach, dive into a refreshing pool, or enjoy some tee time on a championship golf course. These are just a few of the ways you can spend your time in Seascape! Don’t forget to try some fresh seafood and live music at one of Seascape’s many breezy restaurants. Pass through this community’s iconic pair of triangular pillars and discover a town full of whimsical, optic-white architecture and sandy beaches to match. Winding trails and elegant, perfectly manicured landscapes define Alys Beach. It’s the perfect backdrop for your next beautiful Instagram photo! Want to stay close all of the best 30A beaches, shops, and restaurants? Your Friend at the Beach is here to help! 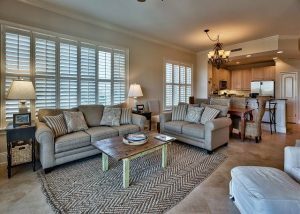 After a fun-filled day exploring 30A’s many hidden gems, come back and unwind in a condo that overlooks the beautiful emerald waters of the Gulf. Our condos have fabulous views, inside and out! All are decorated in light, airy, and beachy colors that invite you to relax from the moment that you step through the door. We also offer concierge services perfect for adding a personalized touch to your family vacation! Whether your personality aligns better with Santa Rosa Beach, Blue Mountain Beach, or Crystal Beach in Destin, you’re sure to have an unforgettable vacation with Your Friend at the Beach. Ready see these sunny spots for yourself? Check our availability and book your stay today!